The Four Seasons Milan is my sort of hotel. It occupies a fascinating and historically important building in the via Gesù, a street which is also known as the via dell’Uomo – for it houses numerous emporia full of those (very) expensive gentlemen’s clothes for which the city is famous. This fashion district (in which there is much for ladies, too) is a delightful area. 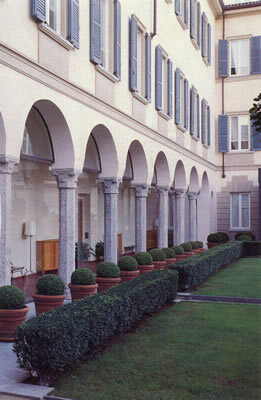 To be able to stay at its heart in what was in the 15th Century a cloistered convent feels like a privilege. Outside, there is the bustle and excitement of shopping; within, there is elegance and calm. 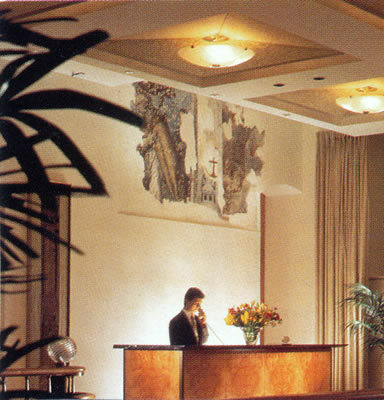 The public rooms are luxurious, as you would expect, but the granite columns and the occasional fragment of fresco create a sublime aesthetic which is found in very few luxury hotels. Clearly, a lot of famous and important persons find their way to the Four Seasons Milan. The service which greets them is of a high order. 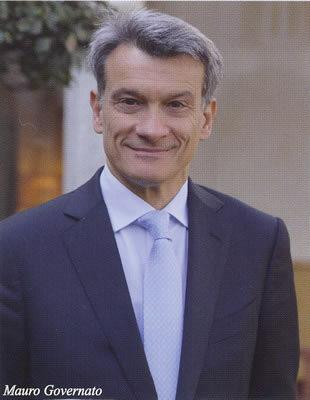 This I attribute to the excellent General Manager, Mauro Governato (pictured). Each member of his staff I encountered was courteous, friendly and highly efficient. I like to note the names of those who look after me particularly well, and I can therefore commend to you Renzo Mannis, the Assistant Lobby Bar Manager (who ensured that my teas – with proper tea leaves and strawberries dipped in chocolate – were occasions of joy), and Andrea Brambati, the Assistant Restaurant Manager (who went out of his way – for example, by securing a more supportive chair for my troublesome back – to ensure that my visits to the restaurant were truly splendid). The hotel has 118 rooms. Mine was on the first floor. 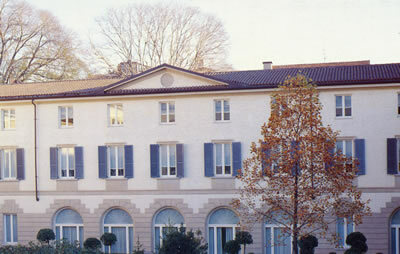 Number 142 is designated an Executive Suite and is therefore 1,760€-2,260€ a night, bed and breakfast for two, according to season. Its pleasing decor is in a style we might call ‘modern Classical’. I liked it very much – not least because I found every one of its chairs both useable and comfortable (which is not something I can say about the seating arrangements in all hotels). I entered first into a large sitting room of brown, green and off-white, with a substantial sofa, lots of cushions and a wall of mirrored glass. Here and throughout, parquet flooring and Persian carpets exuded the sense of old-fashioned comfort which I always appreciate. 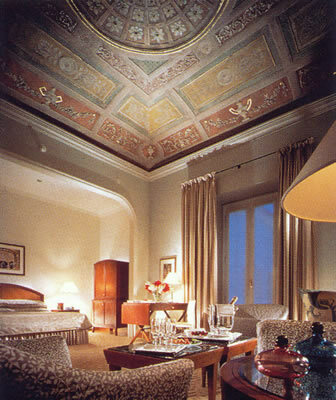 The bedroom was even more spacious, and was flooded with light from the two tall windows overlooking the via Gesù. Later, gentle artificial lighting came from the spotlights, table lamps and (a first for me) the lamps under the bed. That bed had been made beautifully soft for me, and I confess that for my afternoon rest I yielded to its enfolding comfort after I had tuned the second television receiver to the Classical music on Channel 99. On the walls were black and white photographs of beautifully dressed ladies. Their perfection inspired me to high sartorial standards of my own, so I was pleased that, leading to the bathroom, was a proper dressing room. I conducted my ablutions in a chamber of grey and white marble – with one wash basin, a bath of proper size, a loo and a bidet – and used the Acqua di Parma toiletries provided. Usually, the control in an hotel bathroom intended to regulate the sound of the television does not work. (Why this is so, is one of the secrets of the hospitality industry.) But, this being the famous Four Seasons Milan, here the control did work – so I was able to soak to the melodies of Mozart and Haydn. Large white towels of impressive thickness were pleasing, as was the under-floor heating. Properly dressed and discreetly ‘cologned’, I sallied forth from my suite in high expectation of a fine dinner in the Restaurant La Veranda. I knew that my confidence was well-placed, for the Executive Chef at the hotel is none other than the great Vito Mollica – who reigns over the stoves at the Four Seasons Florence (see separate article) and has oversight here. 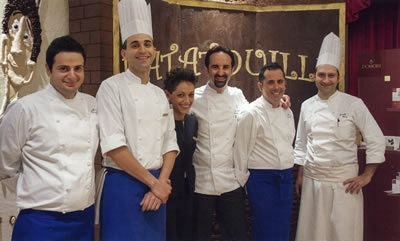 The cooking in Milan is done by Chef Marc Veneruso. My meal demonstrated that he is a worthy disciple of his famous master. 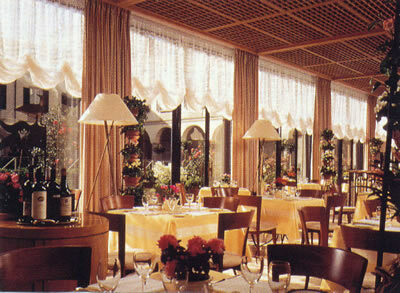 The dining room is a charming chamber on the ground floor. Its waiters wear dark suits and are particularly friendly. The napery is white (napkins are replaced), the glassware is by Spiegelau and the view is into the hotel garden, which looks wonderfully pretty when lit in the evening. And there is a very good lady pianist, who seems happy playing Chopin at one moment and ‘The Wizard of Oz’ at the next. A five-course menu is offered for 75€, but I chose 4 courses à a carte (for which you should allow around 110€). I began with some delicious Culatello ham from Zibello, well balanced by a pretty arrangement of pickled vegetables. My pasta was linguine, with garlic, olive oil, turnip tops and breadcrumbs. But the star of the evening was undoubtedly my main course – superb quail, stuffed with apricots and served with roasted foie gras. This was a combination made in Heaven, with each element adding to the lusciousness of the whole. I ended with a soft and lovely rum baba with cream and wild strawberries. This was a fine meal. The wine list has 466 offerings, including 17 magnums and 18 wines by the glass. The world is spanned, although there is particular strength in French clarets and burgundies. Prices run from 45€ for 2014 Grignolino d’Asti to 6,900€ for 2011 Romanée-Conti. Among the temptations from Italy are 1978 Gaja Barbaresco (1,850€), 2001 Annamaria Clementi, Ca’del Bosco (360€), 2007 Luce (320€), 2008 Ornellaia (440€) and 2000 Masseto (2,150€). The clarets include 2005 Lafite (1,650€), 1998 Latour (1,250€) and 1998 Cheval Blanc (3,250€). My own drinking included a superb sagrantino from Umbria – of beautifully ripe black fruit and soft, enticing tannins (Sagrantino di Montefalco, Lungarotti, 2009 – 95€). I returned to the Veranda, now full of sunshine, each morning for breakfast. Everything on the buffet was of the highest quality, so I tucked in with gusto to the croissants, raspberries, strawberries, pineapple, blueberries, cheeses, hams, smoked salmon, various breads, marmalade and three types of honey. But I think I liked best the mushrooms on toast, which were prepared specially for me by the kitchen. You will gather that I did not go hungry. This was breakfast as it should be: comfortable, leisurely and completely satisfying. Indeed, the whole experience was hospitality as it should be: a happy confection of luxury, elegance and pampering. No wonder the Four Seasons Milan is my sort of hotel. Via Gesù 6/8, 20121 Milan, Italy.